This is a 112 page regional setting, with hex crawl, a small-ish dungeon and a village adventure. Regional, as in it links up the previous three titles in the series with the region surrounding them. It’s at its best when it’s focusing on its core mission of “pure play at the table.” It drifts off in to Isle of the Unknown encounters at points, providing just window dressing instead of interactivity, in contrast to its Pure Play mission statement. It also revels in its text too much, generating some wordiness that detracts from scanability. When this is good it’s quite good and when it loses focus it drifts off in to focusing on the trees instead of the forest. Great in-voice rumors and maybe a bit light on treasure for gold=xp games, there’s a good focus here on play at the table, as one would hope when the designers state it in the products mission statement. The hireling who eventually steals, the horse buyer who doesn’t really care where the horses come from, a slave trader of dubious quality, a grove of weird fruit that can heal you. The region generally delivers encounters that have some memorable quirk as well as a good degree of interactivity. In many of these cases there’s this Potential Energy thing that I sometimes talk about. A kind of tension inherent in the encounter that can drive to interactivity with the players. They WANT to do something with it. Interact, talk, loot, whatever. That is key to a good adventure and this has that. Usually. Some drift in to Isle of the Unknown territory in which things simply EXIST, without that energy to drive action. At one point there’s a great bronze arm laying in the countryside with a family of talking badgers living in it. Ok. And? There’s nothing more. There’s nothing necessarily wrong with a short two-line description, like this one has, but I’m generally looking for that tension/potential energy in an encounter and this one doesn’t have that. There’s a place for empty rooms in a dungeon and I’m sure a place for a friendly group of talking badgers, but by giving them something they want, ot have, then we prompt a bit more interactivity. The adventure isn’t full of these, most of the encounters ARE interactive, which makes the non-interactive ones stand out more. Tonally, the adventure stands out also. It drifts in to the silly side of things a bit too readily. I’m a big fan of the Rients Stooopid play style, but I get quite nervous the more silly/stupid elements are introduced. In Actual Play I’ve got little trouble Going There, but my tolerance for it, in written form, is greatly diminished. A little goes a long way when baking it in. There’s some need to maintain the facade of Serious Elf Game or else I tend to lose interest. So, some=ok and there’s a line. Do robo dwarf monsters with chainsaw hands cross the line? How about monsters yelling out that they have a fabulous deal on a timeshare for you? The Hydras have cranked it up to twelve with these when eleven was more my style. Monsters calling out about hidden treasure, etc, in order to lure the party? Check. Monsters offering Bay Lake Tower rental point deals on a timeshare colet? Good concept poorly related, I think. I recall some Level 5 Robin Hood adventures in Dungeon, or some Magical Levant adventures. Turning it up to twelve narrows the use cases and endangers dismissal instead of riffing. The writing and language used in the encounters revels in itself. Layered, dense in its imagery. And if I’m going to knock Talanian for the readability in his High Gygaxian then I should also knock the Hydras for their layered opium. The writing can reach points where the density fights immediate comprehension. Recall, I want to read this once and then scan the entry while running it at the table. The lushness of the text fights against that in some cases in the exact way that High Gygaxian can. After donning a woefully cursed helmet, this diminutive Black Hobbit began roving the land in search of a place to wreak his darkest fantasies of violence. The awful fetid heart of the Frog Demon Temple seemed like a sound spot to enact such dire plans (plus it got him away from all those irritating Chaos Party membership drives). Rather than attacking on sight, Cholly will wait until PCs are involved in something distracting before sneaking in from the sides and attempting to target the most vulnerable members of the group, either with standard weapons or his four bombs (hand-sized stereotypical black spherical bombs with sizzling fuse). Cholly wears a gleaming helmet with two grotesquely-oversized horns spiraling upwards. The helmet is actually a particularly annoying minor frog-demon, so reviled in demondom for his frequent and tediously predictable rage-quits, that he has been permanently bound into the item-form known as the Birse-Helm of Mnuch’s Extreme Vexation. The helmet provides infravision out to 60’ while worn, and allows the wearer to deal an additional 1d6 damage on a charge. Unfortunately, it also causes a deep and furious insecurity in its wearer. Any suggestion or attempt to remove the helmet will cause the wearer to respond with a (quite literal) homicidal rage for 1-8 rounds. The helmet may only be removed with Remove Curse or the death of the wearer. The first adventure, the Frog Demon temple, is advertised a lower-level Tomb of Horrors, and it is. Complete with a statue on a pedestal with a spell on it to make it impossible to lasso, etc, and special giant frogs trained to hide under the water. That sort of thing is absolutely in the vein of a bad Tomb of Horrors adventures. Beets for the Beet God involves a cult takeover of a village/region, etc, and is more open-ended. The Village Generator, Rural Carousing and other info in the appendices are quite nice and accentuate the setting well. Completionists who own the other three books will want this one. I would not suggest this as the first exposure to the series. Ursine remains a great introduction and Marlinko the best of the four, with Eld being the perfect follow-up to both/either. The rest of us, well, we have hard decisions to make. The book is interesting and creative. Most of the wandering encounters are good and great many of the locales are good also, with the specificity needed to fire the DM’s imagination … if a little muted in total length. It’s weird. I think the encounters, for their actual length, are not more content than the one or two sentences found in Wilderlands. Or that’s the impression I have anyway. In contrast my memories of the other three books ar that they are more pamphlets, instead of the 112 pages of this, and choked full. A testament, perhaps, to the overall quality of those other three. It’s lush. It’s interesting. And it strays in to ‘12’ territory where ‘11’ would have done. This is available for $12 at DriveThru. The preview shows you good rumor table and then shows you the Weighty Conversations rumor table, with lengthier descriptions. The last page shows two hexes. The first is irrelevant, since its the Misty Isles. The second though is a decent enough example of what a hex contains in What Ho. This entry was posted in No Regerts, Reviews. Bookmark the permalink. 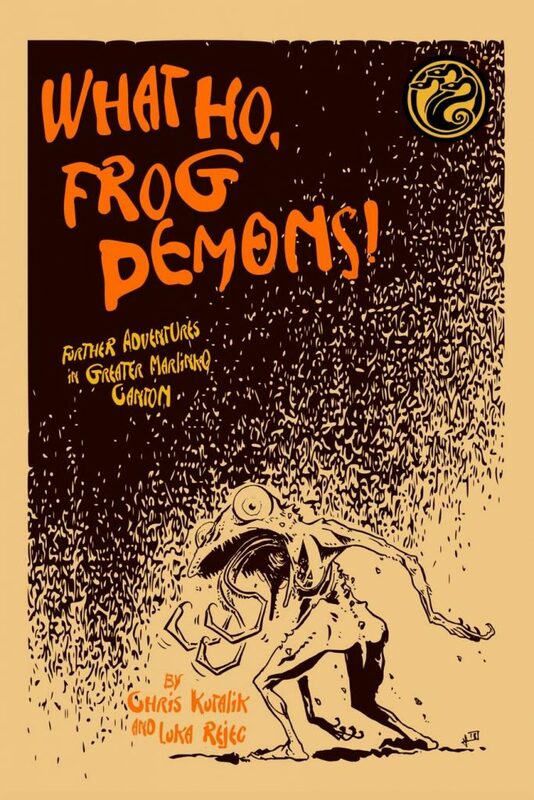 24 Responses to What Ho, Frog Demons! I think I am going to pass of this one. Strange where we each draw the line, but for me it was the condo time-share comment you quoted that breaks down the fourth wall. Better in my mind is they try to sell the characters a fake treasure map, or something else a bit more in-genre. I’m OK will elements of the modern world showing up in-game, but they at least have to be disguised with a pair of fake glasses or false moustache. Thanks for another helpful review. Reading them is a real joy each week. I heard a great deal about the Hill Cantons but, unfortunately, didn’t really scope it out in detail before I picked this up. It’s a joke adventure; perfectly fine with high-humor campaigns, but not super-useful for others. It’s certainly written well; I laughed out loud more than once. It’s just not for my gaming group. I found this mildly disappointing and not really what I enjoy; for me it crosses too far into the silly side of things crassly to be really of use. Also the structure of the thing…I found it hard to use and weirdly done and frustrating…a bunch of the tables have references to things you need to find out/know/is else where, making the whole book kind of a pain to use. When you say crassly, could you elaborate? I’ve been trying to figure out where the line is and/or what this stuff is called. I’m a Hydra supporter in general and a KS backer from SUD so got this PDF as part of that and got the print version at cost. As a completist, I’m glad to have it. But I do find this the least immediately useful of all the publications in this line — maybe the least modular? Least adaptable to another world or setting. “Beets for the Beet God” I think can be generally usable and should port well to other games and places. I’m less sure that easy use can be made of the Frog Demon temple without a good bit of adjusting. The hexcrawl material, while often clever and evocative, likewise strikes me as more specific than material in the earlier publications. There are some inside-baseball jokes mostly at other RPG producers that — and maybe I’ve just been out of the scene — seem kind of pointless. Top marks for imagination and art, though. I realize your comment was not directed at me, but I’ll throw my $0.02 in if you don’t mind. Gonzo is introducing out-of-genre elements and trying to make them at least superficially plausible, e.g. spaceship crashed in the mountains. Stepping completely out of the framework and injecting elements that incompatible with the gaming context—i.e. things that raises impossible-to-answer questions for the DM—are crass/silly. A classic example of crass content is implausible dungeon ecology: What is that dragon doing there in the room next to the orcs? How did he fit through the door? What does he eat? Why doesn’t anything next door hear it? It serves to degrade the participant’s suspension-of-disbelief. There is no plausible world in which that makes any sense. Why that gonzo/silly line is perhaps so muddy is because each little social-group playing the game has it own shared-reality, and what falls in-context (or out) is a bit of an unspoken agreement. Western firearms, OK. Magic Mouths streaming Netflix, silly. Why your reviews are universally valuable is because you’ve chosen to focus more on the mechanics of useful presentation rather than good-versus-bad content (which is way more subjective). Felt the same way, Bryce. A little too openly silly for my taste, which is a shame because this is the things that’s supposed to tie all of the other adventures together. Players can be silly enough without jokes intentionally inserted. And thank you for spell checking. There’s an old adage that used to be kicked around the blogosphere about the world being the “straight man” for the characters’ antics, and I think adventures like this highlight why it’s more effective to keep the Silly Ball in your players’ court. Yeah. This weekend we laughed so hard we had to suspend the game briefly to regroup while playing through “Praise the Fallen” (https://tenfootpole.org/ironspike/?p=4615), which concerns an anti-existence void cult worshiping fallen goth angels. No extra Groucho masks needed!The world is a horrible nightmare of murder, theft, and misery. That’s why we have players — to make all of that fun. Clearly, Chris’s game is a blast. I have played with him a couple of times and had a great time. But it’s harder to force a transfer of the larfs from one group to another. Playing through some of this content (The Tomb of the Great Denodad at least) much of the ‘silly’ stuff works in Chris’ hands. The Denodads are terrible and terrifying – they keep up their bizarre Multi-level marketing sales pitches even as they try to kill you. You henchmen sometimes believe them which is sort of worse. In the world of Hill Cantons – where everyone is trying to scam everyone, all the time, the utterly flimsy and mad nature of the Denodad’s efforts is a clear sign that they are without any redeeming feature and (unlike almost every other creature) can’t be talked away or around. I don’t know if others would have as much success with it. There’s a lot of stuff from the campaign in all the Hill Canton’s work and it is very near the surface – that Hobbit is ‘Charly’ a long time PC for example. There’s a reference to my deceased Eld renegade PC in there – more veiled. I also wouldn’t be surprised if these references work against the book a bit. The Beet God adventure is great though and honestly it’s a big chunk of the book. What are the Magical Levant Adventures? Arabian Nights themed stuff? The Levant is a little west of Baghdad, so that might not be it. This needed an editor to take out the “wink wink, we all laugh at this at our game table” tone that pervades it. It’s a bit too much “the author’s campaign put in presentable format” and too little working to give ME, as dm, cool stuff for my table. I end up feeling like the audience is the author himself more so than me and I simply don’t like that in an authorial voice. I like the format of a sandbox setting with developed adventure sites in it though. There are not enough of those going around when it ought to be the default format for settings. And it does have plenty of engaging elements and good flavor. Not sorry I got it, but a bit sorry that what was meant to be the magnus opus of the series turned out to have the potential to be that yet felt just a bit short on its promise in execution. Message received, course adjusted in the next book (and I do appreciate the “hey you have spinach stuck in yer teeth” feedback). Gus dinged me long ago on a review of Marlinko for the Church of the Blood Jesus, a campaign in-joke—and yes that’s the main culprit the closeness to all of this to the real table play and not just clinical playtesting—and I took it to heart in Misty Isles (which was more divergent and more designed for translation). I think the second layer of flaws just springs out of how my own personal life has been exhausting and dramatic for two straight years and my head just hasn’t been as much literally in the game until this month again. Not an excuse just honesty about why I didn’t push back on the considerable mission creep of this product which went from I’m just presenting these two micro-sites alone and unvarnished to the 100-plus page beast it is with a whole other mission. SUD started with less is more and I have a feeling that I’m swinging way back in that direction. Mea culpa. I still think DMs have a lot in there that they can use functionally and that the time is more like 11.35 overall, but hey I would wouldn’t I? Y’all are the audience and the judges and I’m at least a decent-ish listener. Harder to produce, than to criticize. Thank you for putting your work out there. I’m reversing course, and have decided to pick up a copy. That’s a great response Chris! Less is totally more…also, I would get someone to take a deep look at formatting and layout to make sure it’s useable at the table. Currently I feel that anyone trying to run this would need to read through the whole thing, take notes, highlight the player facing parts, and link to the maps etc. Will buy the adventure purely based on Mr. Kutalik’s response. I bought this and it was my first experience in Mr. Kutalik’s realm. I didn’t like it…BUT….I recognized the talent and the effort. And (like nearly every gaming product… I found things that made me laugh, made me think, and made my imagination spark). I’m of a similar opinion now as several of you. Having read this incredibly classy response, I feel much better about my purchase and will look forward to something else coming down the pipe that keeps the imagination and incredible imagery cranked up, while fading the gonzo slider down a few notches. Have you read Bryce’s review of Slumbering Ursine Dunes? I backed the SUD Kickstarter pretty much on a whim, since I was in the mood for a Labyrinth Lord adventure, and I’ve been buying Chris’s stuff ever since. SUD definitely has imagination and incredible imagery, and is less gonzo. Of course, pretty much everything is less gonzo than WHFD, but this might hit the spot for you. I’ll check it out, thanks Jeff! Would that be possible by simply tweaking/even removing a few encounters or does the mood pervade the whole work? I actually was contemplating a blogpost about what elements I think you could cut or change to make it less obviously funny. Certainly the deodands, it’s just a single kind about the timeshares. How it was played at my table was kind of sinister but funny, they would whisper entreatmentd from the bushes.